Korean electronics LG launched its smartphone called LG Optimus G Pro in Indian market this week. Optimus G Pro is the highest priced phone from LG’s stable for Indian market. While the company is eyeing a slice of the share from competitors like BlackBerry, Samsung, Sony and Apple's iPhone, the company has announced investment of Rs 80 crore to push its sales in the country this year. 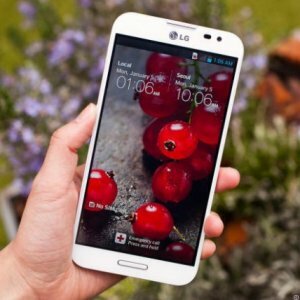 Let’s have a look at five interesting things about the LG Optimus G Pro. The phone runs Android v4.1.2 (Jelly Bean). A 1.7 GHz Qualcomm Snapdragon 600, Quad Core processer will ensure good quality performance. The user will also have ample 16 GB (10.5 GB User Memory) memory clubbed with a 2 GB RAM. The phone has a 5.5-inch full-HD display with a capacitive touchscreen. It has a full HD resolution of 1920 x 1080 Pixels. Other displays include a corning gorilla glass 2, ips display, which will ensure that you have a fantastic viewing experience.